Ok we are back on board, I have been away for a couple of weeks getting married and enjoying the sunny islands but Im back and ready to attack another busy season. This season seems to be shaping up for another busy summer period, bookings have been flowing in most days and Im doing my best to fit people in. Thanks for the support and Im sorry if I have been slightly slow over the last two weeks. While Im thanking people Id like to take the opportunity to thank some of my closest best clients for making the trip to my wedding in Rarotonga. It was a great trip and a special day with friends , family, clients and people in the fishing industry – you are all valued people in our lifes and we certainly appreciate the effort you guys went to making our day special. In the past couple of days I have had a quick look about in the rivers before I start work tomorrow and have found some good numbers of fish in the Tongariro finally. It did not take long before we scored some really good fish in the lower riverÂ using small naturals and some slightly older trout up around the Stag. The afternoon continued to fish well with some fish slowly looking to the surface, it wont be long and dry fly will be in full swing. Fishing pressure still seems to be low and Im starting to wonder if it will get busy this season especially with such a mixed season. No doubt the bridge pool will be busy day in day out but that doesn’t really count does it. 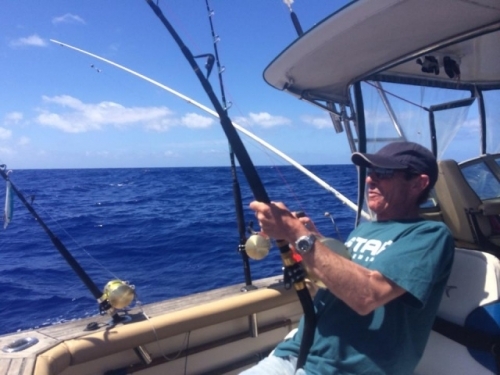 Most anglers seemed to be catching a few fish in most pools and those who moved about certainly did the best. Glo bugs were off the menu!! We also decided to stop in and have a quick look in the Hine and see how this was travelling . The Hine has been the best fishery in Taupo again this winter season. It has delivered great trout when it should have, they have been reasonable in size, great in condition and numbers have been good-take a bow as this system has saved the status that Taupo has for fly fishing in my opinion. The HineÂ is still sporting a few trout but many of them are fairly dark and been in the river quite sometime now. Many trout have been seen hanging on spawning beds this season and these can still be spotted with ease. A large population of small fish will appear shortly and become easy to hook up, especially on small dry’s and swinging nymphs- these guys will attract the lovely black shags also. The back country will be the place to be over the next few months especially before the crowds make things hard before Christmas. Back country fish should be hungry , fat and on the bite especially when conditions are clear and favourable. These rivers seem to attract plenty of anglers in holiday periods and fish really become different to catch-generally harder!! Remember to practice catch and release on these rivers despite what others might tell you , it actually really effects fish numbers in these areas and you may not be so lucky next time. Reports in today from another guide tell me Lake O has fished really well over the last few days he has been stripping small wets over the weed beds and fishing deep nymphs in the holes. This fishery seems to be wicked one day and terrible the next at this time of year, wait till the water warms up and the insect life gets going and it will be more reliable. In saying that there is always cruising browns and smaller rainbows to be had from most of the shore line weed beds, plonking or nymphing will be the best way to get these cruisers. 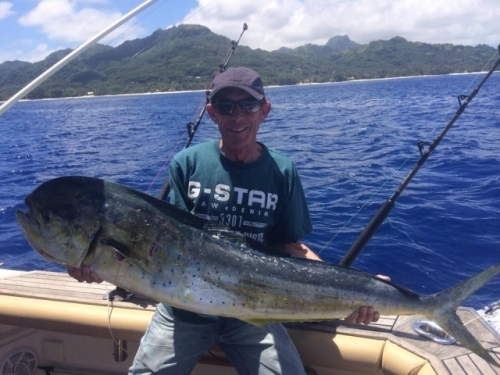 While I have been away I made the most ofÂ the tropics and got into a few charter boats in the cook islands-infact I went with three different ones so if you need any info on who to go with give me a ring and I will send you in the right direction. 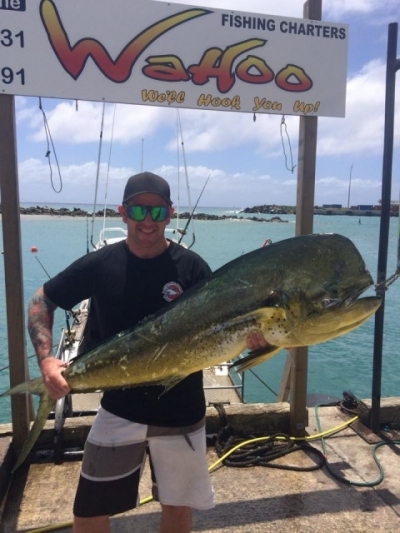 Game fishing in the Cook Island can be fantastic at the right time of the year and we hit it pretty good for Mahi Mahi a fantastic tasting warm water game fish. I was lucky enough to catch a good bull which weighed about 19 kilos and Dad got a great female which was about 17 kilo. Marlin, Tuna, Wahoo are all game fish which can be caught from these waters and is well worth exploring if you are on holiday in these waters.